love | Kierra Raine and Co.
And in just a few days, it will be another thing. 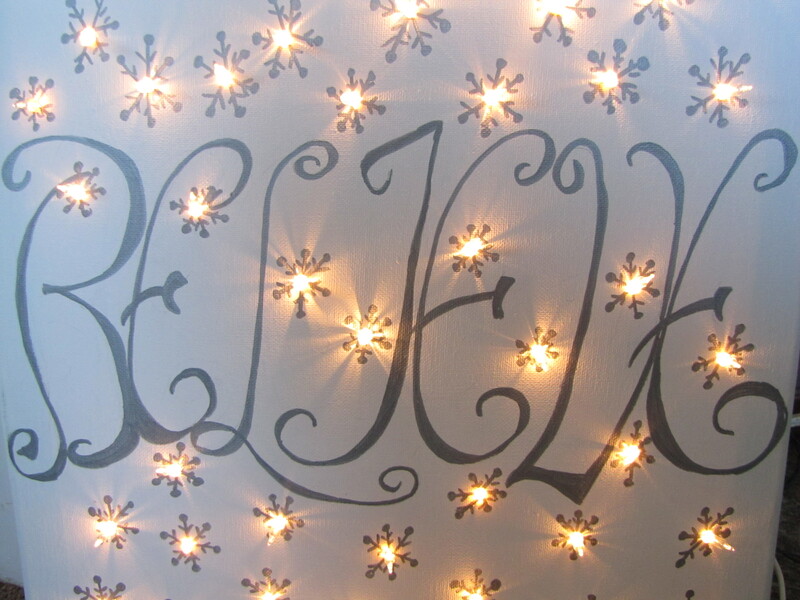 Read a bit farther to understand why I chose the word BELIEVE and to see how to enter the drawing to win. I hope that this winter finds a glow in your heart. The privilege to BELIEVE. even when it’s hard. A bit over 8 years ago, my Big Guy and I met for the very first time. Just in case you didn’t know, I LOVE a happy, fuzzy romantic love story. One of our first ‘run ins’ was at the bottom of a Rocky Mountain foothill under a gorgeously lovely moon that was edging the frigid clear night with it’s impossibly soft warmth…..
a perfect set up for some heart sparks to fly. Instead, I was bleeding red all over the front of Steve’s grey jacket and was convinced that every breath would be my last. That’s what happens when the most lovely innocent toboggan ride with girlfriends ends abruptly.That’s what happens when barbed wire meets face. Cruel cold steel wired across flesh. And scars were created. It was ugly. And scary. And not at all what I planned. I don’t believe in omens but do I believe in God’s omnipotent plan for our lives. Sometimes, in my wandering moments, I wonder if God was trying to tell us something way back then. That He makes beauty out of bloodshed. He keeps us breathing when we have no strength left to keep going.That life doesn’t always make rational sense. One thing was bigger then ever…those lovely heart sparks were flaming higher and hotter then ever! We were getting married! The day I promised my life to the best Big Guy in the world. The ironic thing was, the year before, I had gone west to teach a tiny school and carve out time with my Heavenly Father and try to figure out some hard questions of life. I wasn’t interested in guys. But girls will be girls. And when that true Love steals into your heart no matter how much you try to deny it….well, lets just say I was honored and thrilled! It’s been seven years. There’s been bloodshed in our hearts. But there’s also been warm hugs that take in all the pain. So much love that pain morphs into beauty. So many wonderful moments and happiness. But we still live in a fallen world. As long as we are here, we face it. Sometimes its hard to BELIEVE. When I want my way and I don’t want to play fair and I am sure we are heading for disaster. When I let ridiculously small unimportant everyday things turn into a monstrous block wall. When I bang my head against it and wonder why it doesn’t budge. When I misunderstand. When life hands me things I never asked for and warps my confidence that God is good. All the time. When I don’t know what will happen next in life and it feels like your stuck in the waiting room. And you don’t want to be there. When others hurt and you can’t take away their pain. I never would have believed my life if you had laid it out orderly for me while I was packing my bags for Montana 8 years ago. It has been so wonderfully GOOD and GRAND! But it’s also been brutally hard. It is my life. And I embrace it. to keep me and never leave me. My husband. My amazing wonderful Big Guy that has taught me to trust and love and given me a safe place for my heart to come home. and I love like crazy. because God has put so much love and peace and hope in the midst of the blood and tears. So here’s my wish for you this Christmas. The chance to experience God. It’s something we must each do for ourselves. Let me assure you. He will meet you and love you and forgive you. 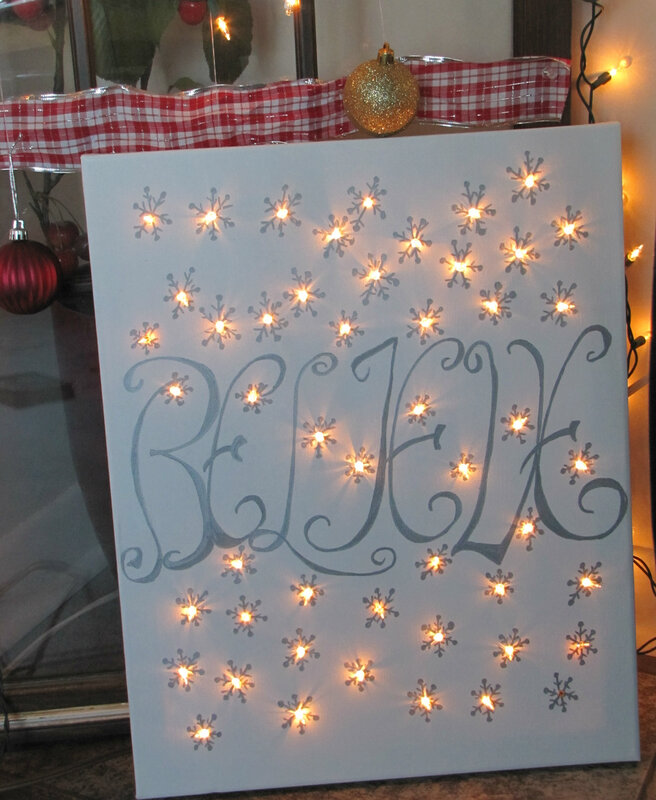 This is a white canvas done in Silver script and snowflakes with 50 lights. It measures 16×20 in. and has easy access to the Christmas light’s plug. Leave your name in the comments below to enter this giveaway. The winner will be announced on Monday, December 8.